All INDOOR MEETINGS are held on the 4th. Friday of the month, unless otherwise stated in the programme, in the JUBILEE HALL, STANLEY ROAD, KNUTSFORD. Members gather at 7:45 for an 8:00 pm start. Directions: Approaching from the north on the A50 (the main road through the town) turn right into Stanley Road at the main set of traffic lights in the center of Knutsford (the second set you come to). Approaching from the South turn left at the lights (the first set you come to) and turn into Stanley Road. Approaching from Macclesfield (A537) it's straight acoss the lights into Stanley Road. In Stanley Road take the first right into the car park of BOOTHS supermarket. After only 20 yards turn right into the small car park. 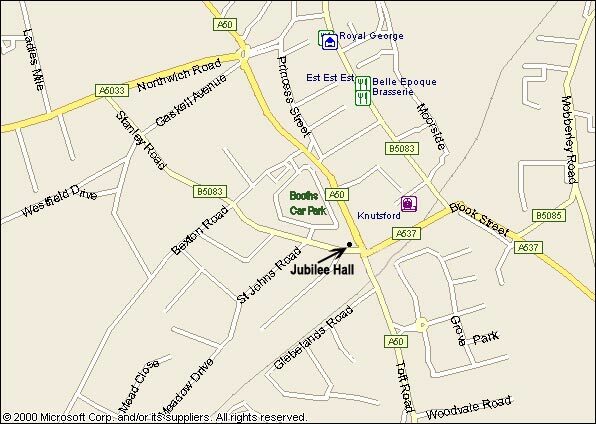 The Jubilee Hall is in the new building directly in front of you, the entrance is on Stanley Road walking back towards the traffic lights. Park in this small car park, not in the residents' area.